Pizza probably has the best bang for your buck of anything in the known universe. Whether it's a dollar slice or one of the best pies in the country, you're guaranteed a good time. It doesn't really matter if you're spending a lot or a little, and, lucky you, this week you'll only have to spend a little. 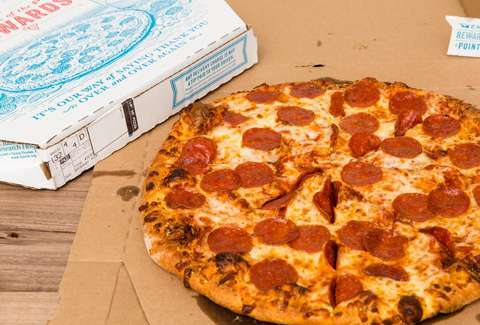 Domino's is giving you 50% off all menu-priced pizzas ordered using any of its online ordering platforms -- like its website and mobile apps. On the website, for instance, all you have to do to get the deal is click on the giant coupon that says "50% Off All Pizzas at Menu Price," and the discount will be applied. Just keep in mind that this is only available through digital ordering. On the bright side, though, you won't have to deal with the whole 'forgetting your own name as soon as you get on the phone' thing. The only bummer here is some that this only applies to pizzas, so you won't be able to get wings or pasta for half price. But why are you ordering those things from Domino's anyway? You have the chance to get something that's guaranteed to be great for super cheap, so it's our humble recommendation that you do just that.